Jimena de la Frontera is a traditional Spanish hill village with rows of white painted houses lining very steep and narrow, cobbled streets. 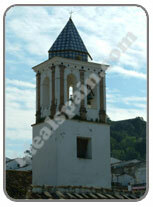 It lies within the province of Cadiz, in Andalucia. The village rises high into the clouds where at its peak stands a Moorish and Roman castle of major importance. In recent years, Jimena has become the hometown of a great number of British expatriates who probably feel the need to be within easy distance of Gibraltar for work and shopping. Within the village are many bars and restaurants and several places to stay. There is also a good selection of shops. It is possible to drive through the narrow streets to the castle, however it is a pleasant if not energetic walk to the peak. Wear sensible shoes and take care if the roads are wet. its a good 15 minute walk from the bottom of the village but the views from the top are well worth the effort. The castle stands on Jimena Hill, an understandable location with commanding views over the bay to Gibraltar and Algeciras. Although the castle is of Moorish construction, it has Roman origins. A Roman statue was discovered in the early 1900's when robbers were stealing stone. The statue was damaged but is now in the care of the council. There is also a Roman inscription at the entrance to the castle which can be dated to 151A.D. The entrance to the castle is by means of an Islamic style horseshoe arch (pictured below) at the base of which stand several large square Roman stones. Within the castle you will find several very important and reasonably preserved structures, such as the large vaulted cisterns (pictured left), used to store rain water. At the northern end of the castle enclosure stands the 19th century cemetery. Next to this is a marvellous structure once used for storage of provisions. The beauty of this castle site is the fact that you can wander, unhindered around the enclosure, admiring the views over the valley. The castle is built with blocks of limestone cut from local rocks. One of its main features is the round Tower of Homage at the south end. A visit to the castle is an absolute must if you are in the area and make sure that you visit the information centre at the entrance to the castle where you will find informative guides and a selection of local crafts to buy. Jimena de la Frontera is one of those places that draws you, again and again. If you want to see real Spain then this is a good place to start.